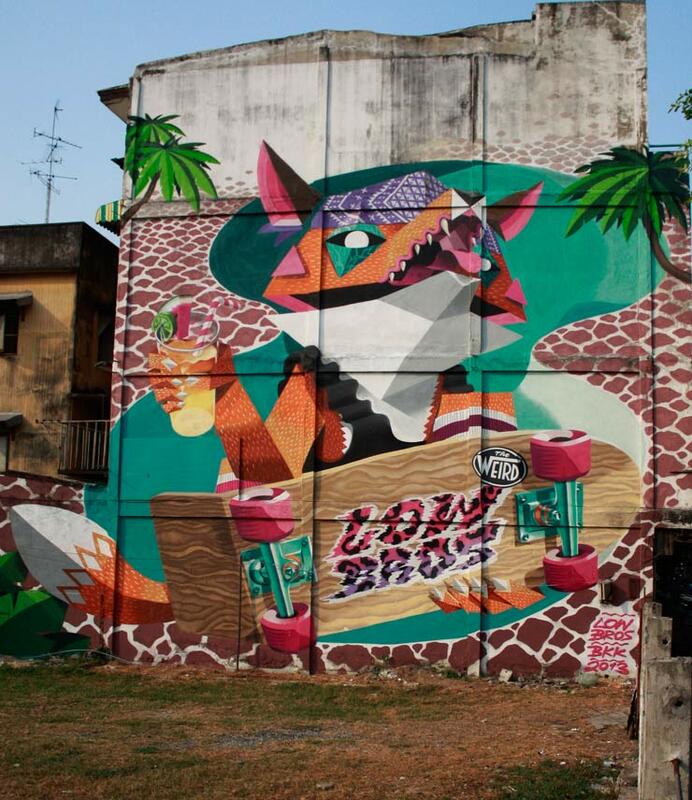 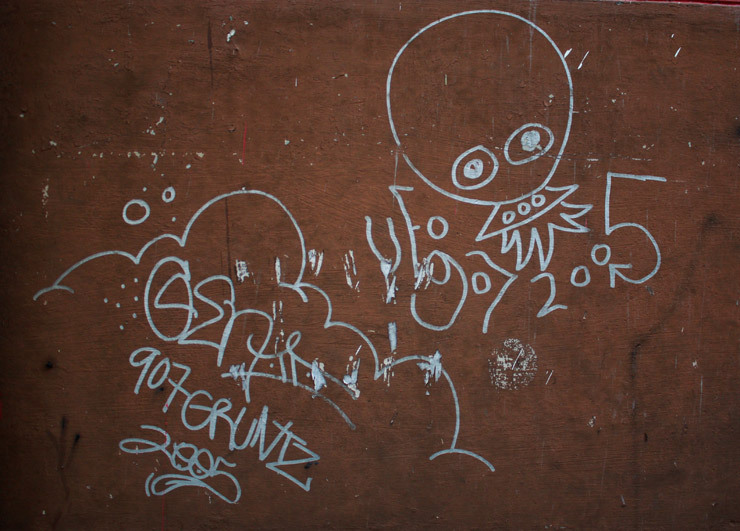 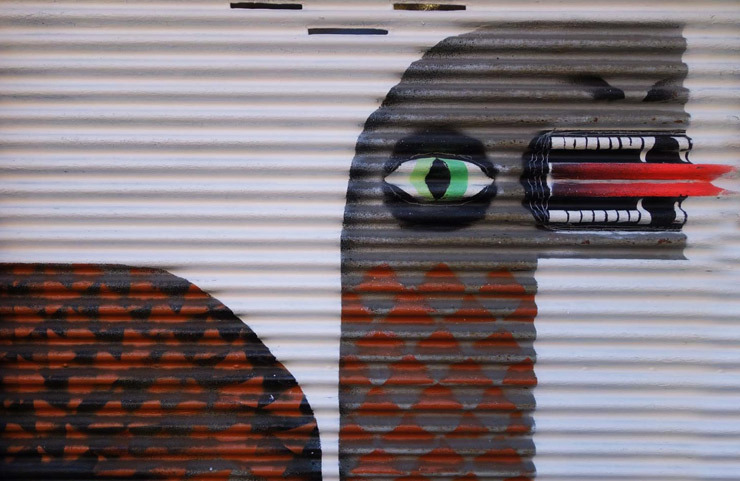 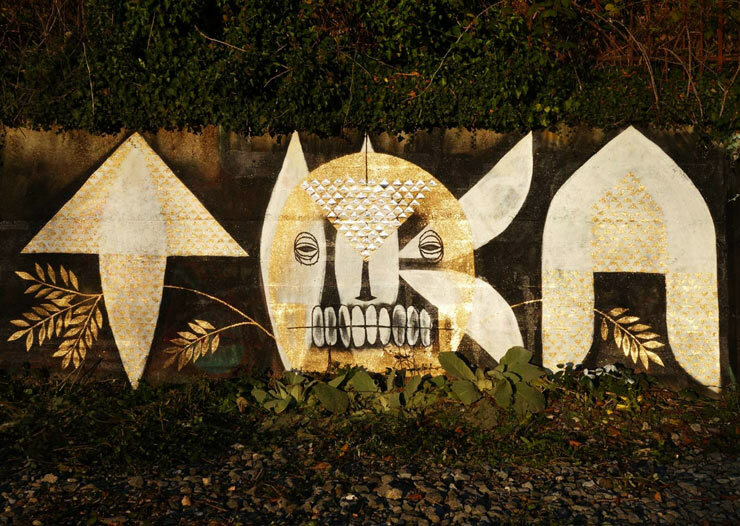 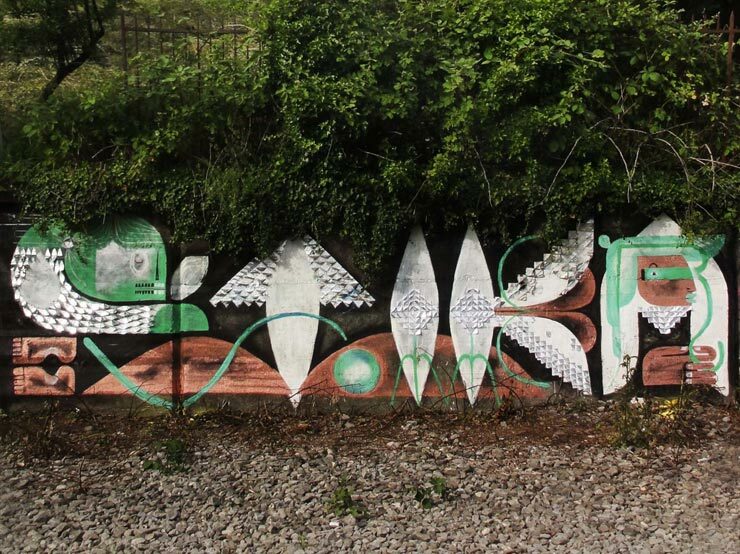 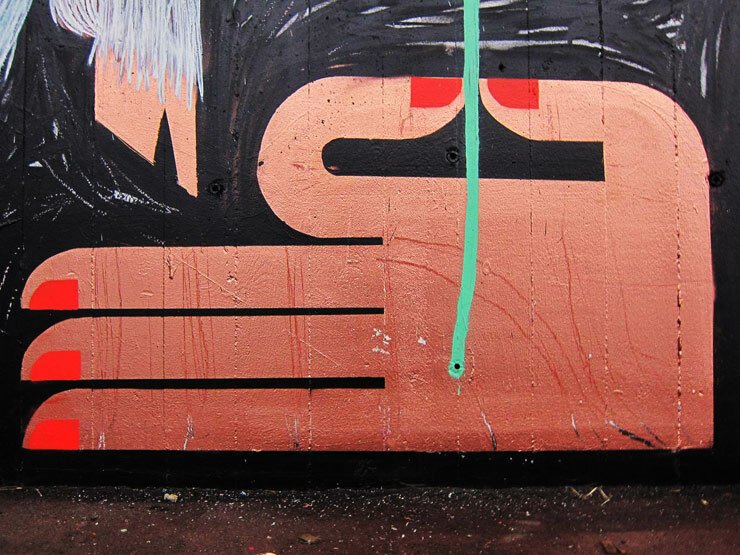 A fine artist who likes drawing and wood burning, TIKA also does her share of aerosol and stylized typography and characters across concrete bricks, along train tracks, and on the occasional van just for fun. 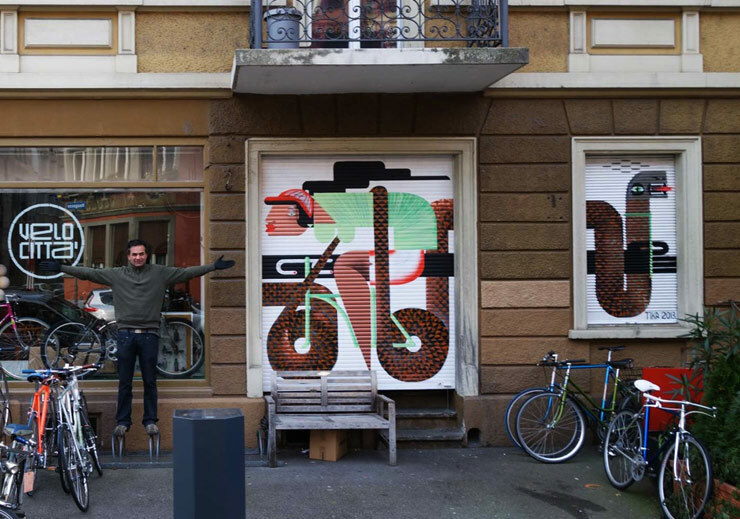 This year has installed new works in Zürich, Berlin, Basel, Küsnacht, Cologne, and Bangkok, where she’ll have a solo show in Spring ’14. 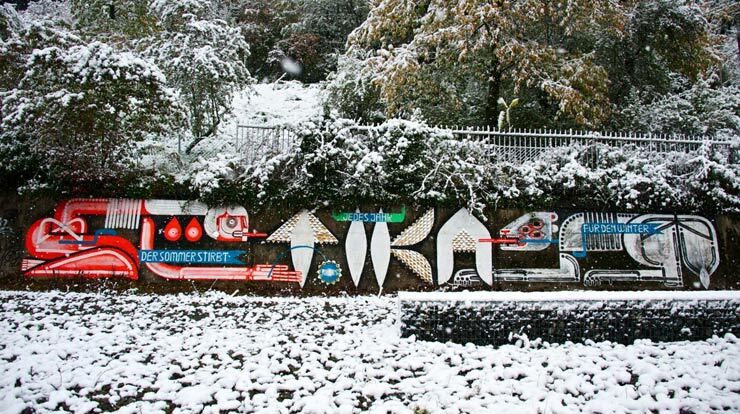 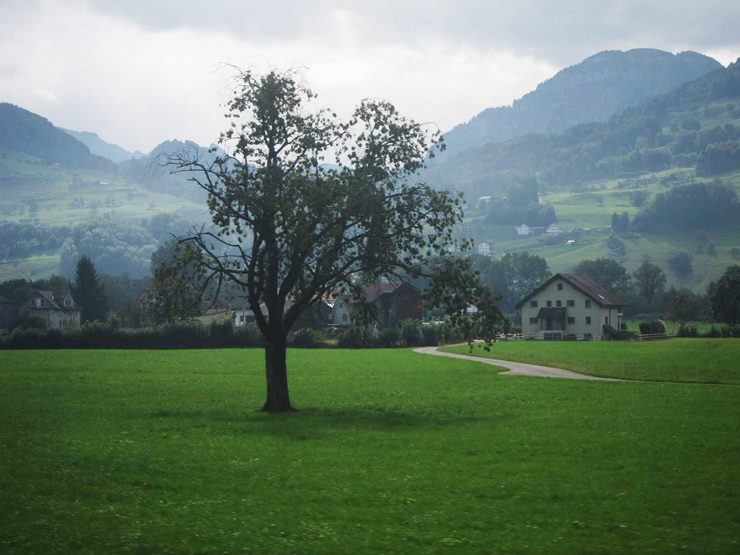 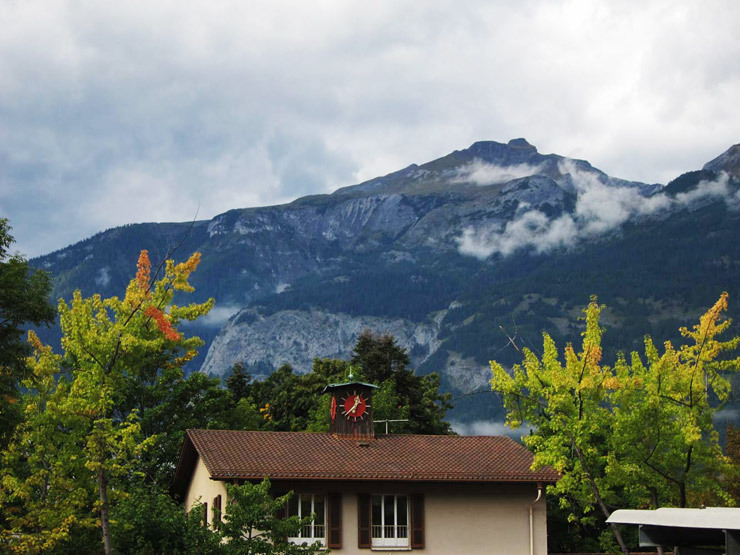 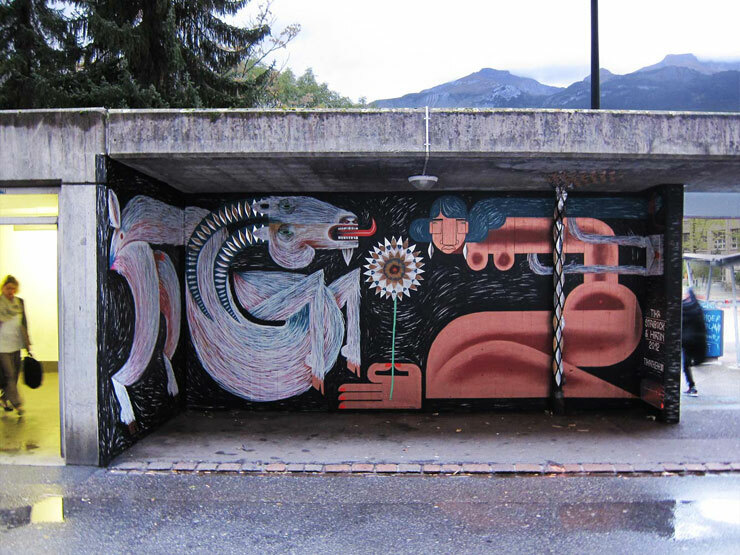 Originally from Switzerland she is currently in Zürich setting up a new studio and she shares images of work completed during her travels this summer and fall – along with a wintry scene from last year. 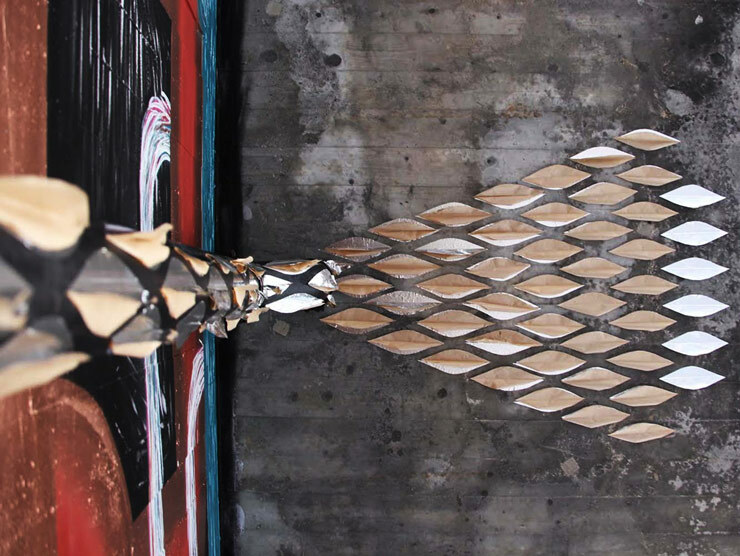 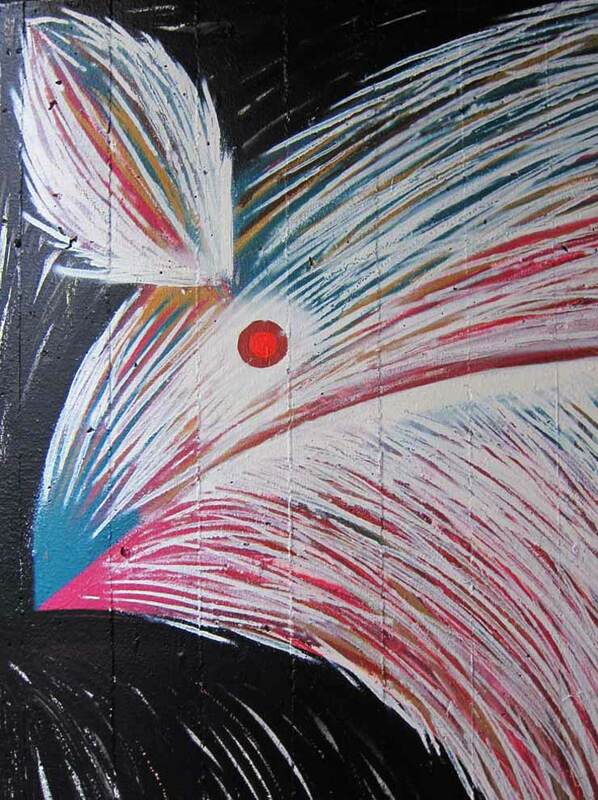 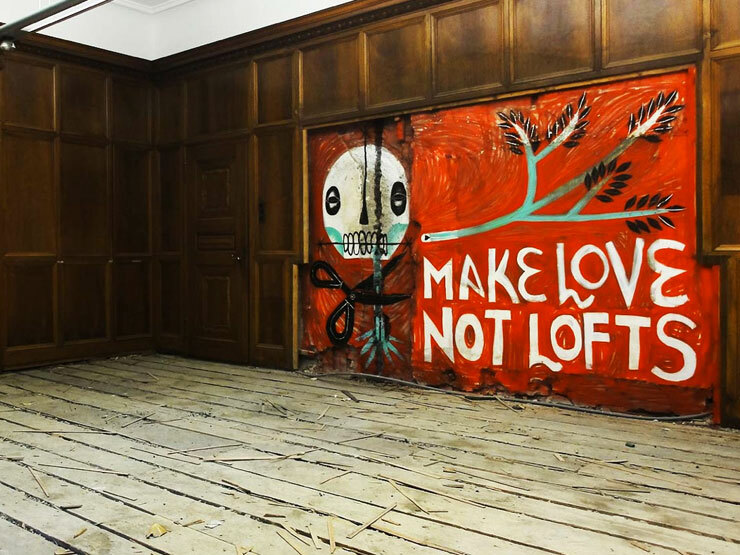 During her travels this fall she completed this quick one in an abandoned building the day before demolition began. 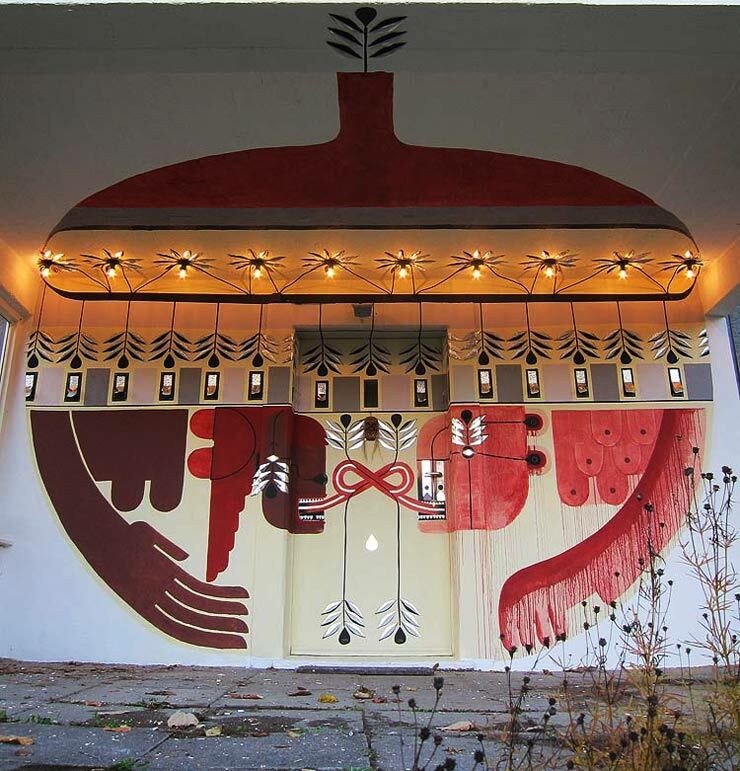 Appropriating the extended tongue motif long before a certain pop starlet swinging on a wrecking ball, TIKA incorporates windows, doors, lights, and architectural features into the folk art inspired patterns and creatures and love scenes that crawl along them in two dimensions. 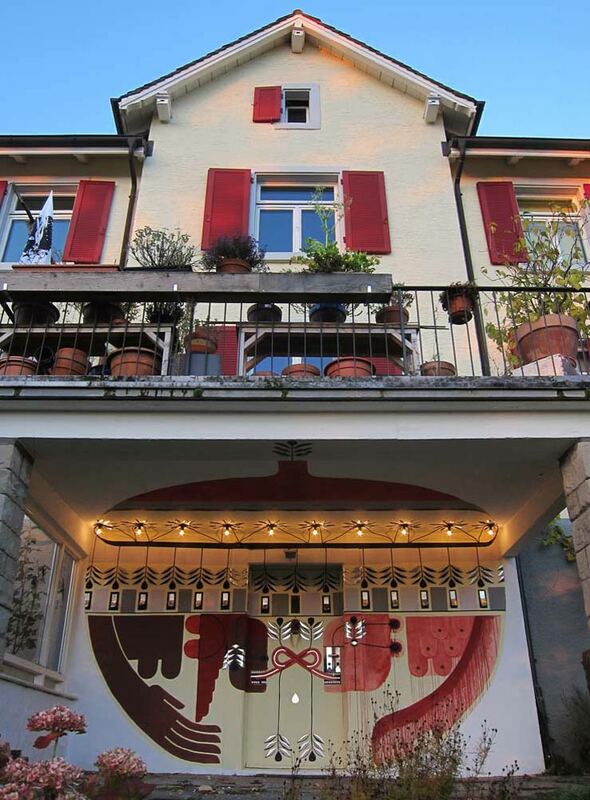 “It was time of grapes harvest and pressing spirit,” says Tika about the transformation of this exterior in Zürich Höngg in November. 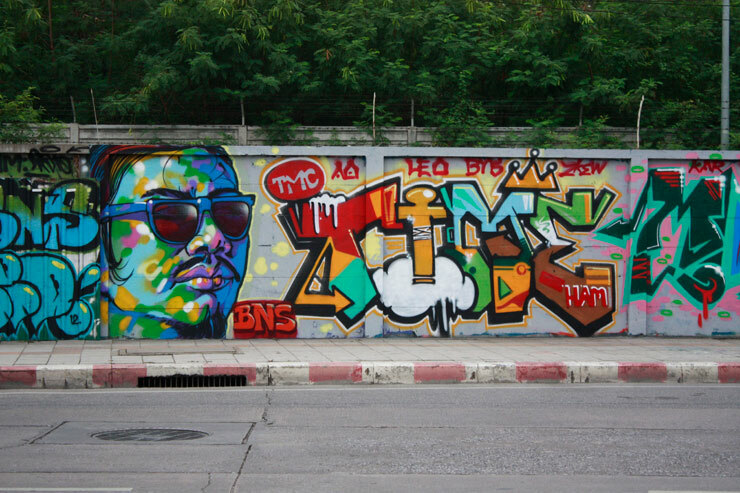 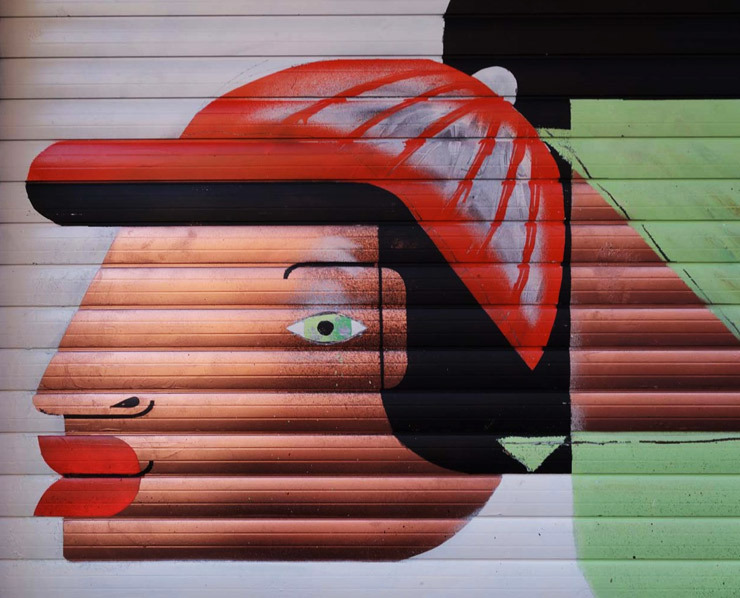 Street Artist Blanco grabbed his camera while visiting Bangkok, Thailand this month and discovered walls full of color, character, and even some graff names he’s familiar with in New York. 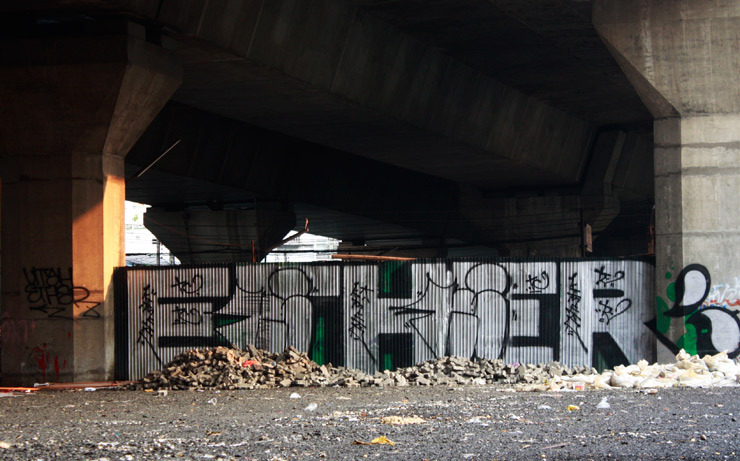 “Utah and Ether are all over the city, crushing it,” he remarks. 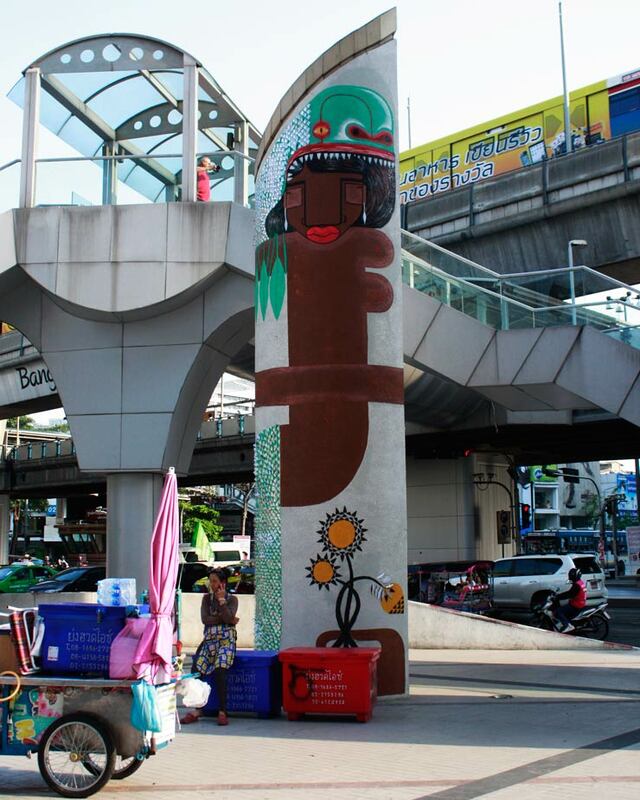 His timing for visiting the city was good too because it coincided with the BukRuk Street Art Festival that ran from February 16 through March 17 and featured 27 artists from Thailand and Europe painting murals and installations in the downtown area of Bangkok. 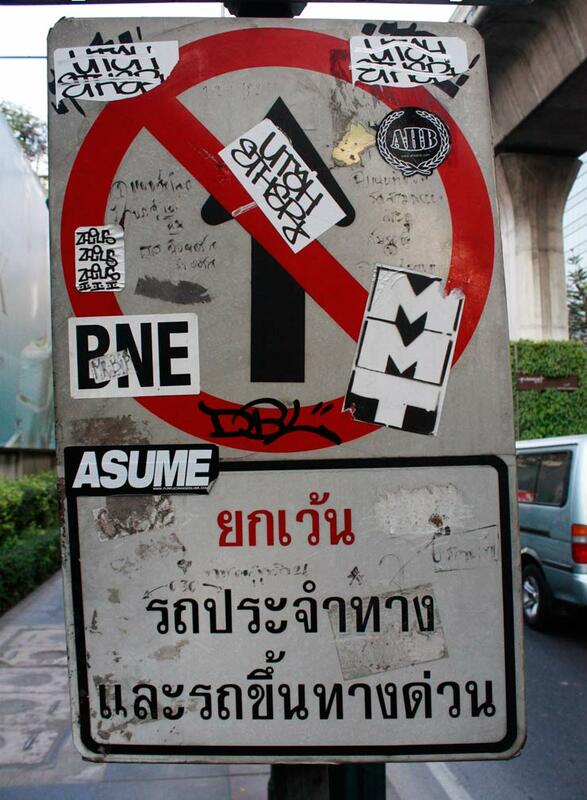 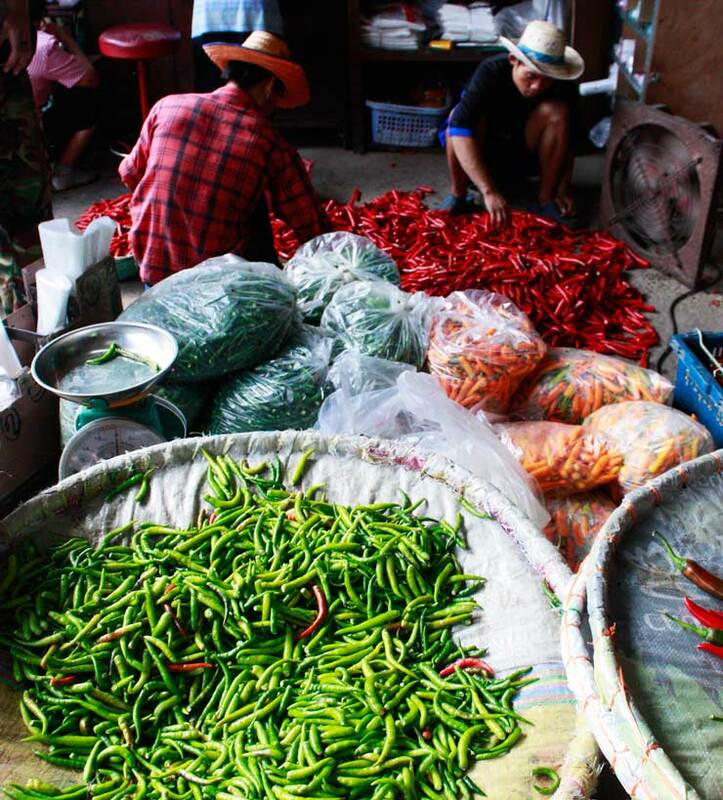 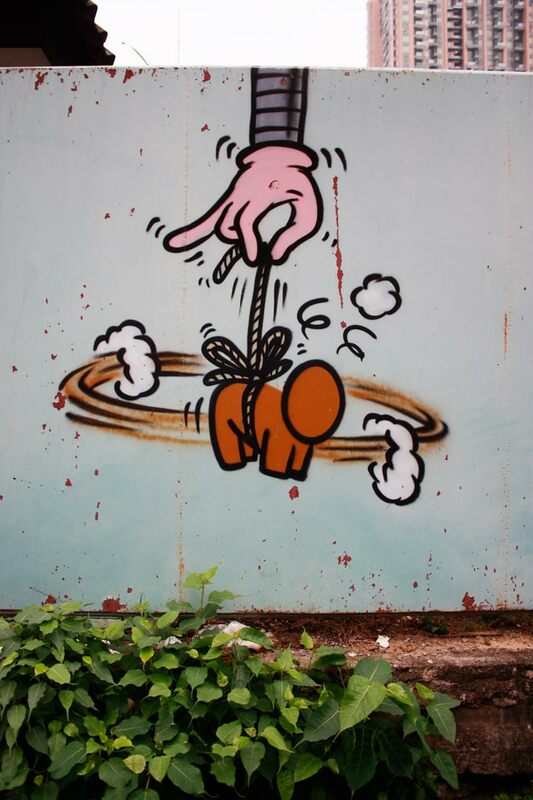 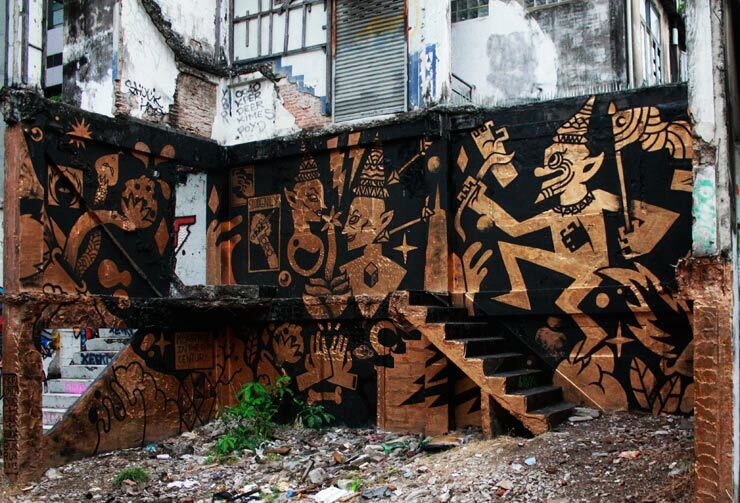 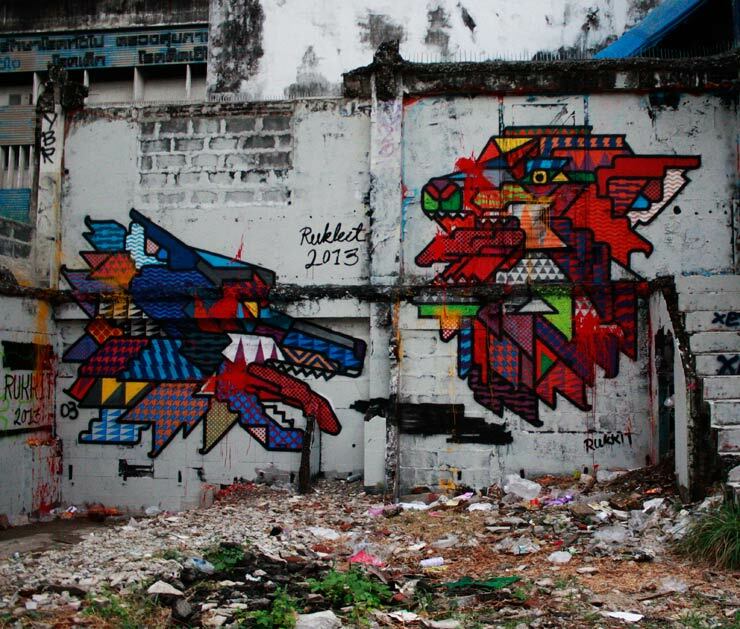 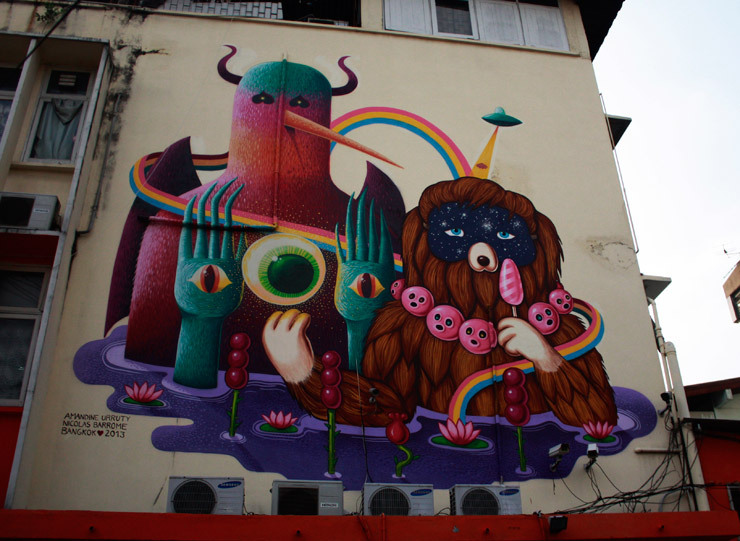 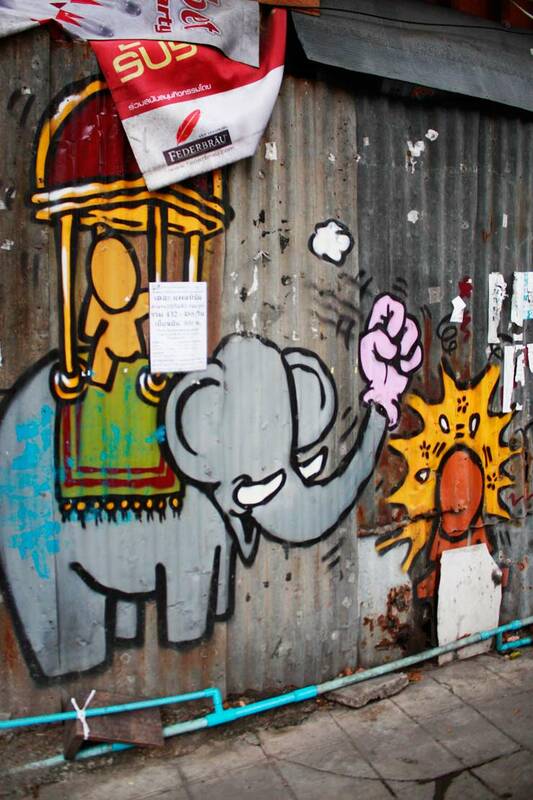 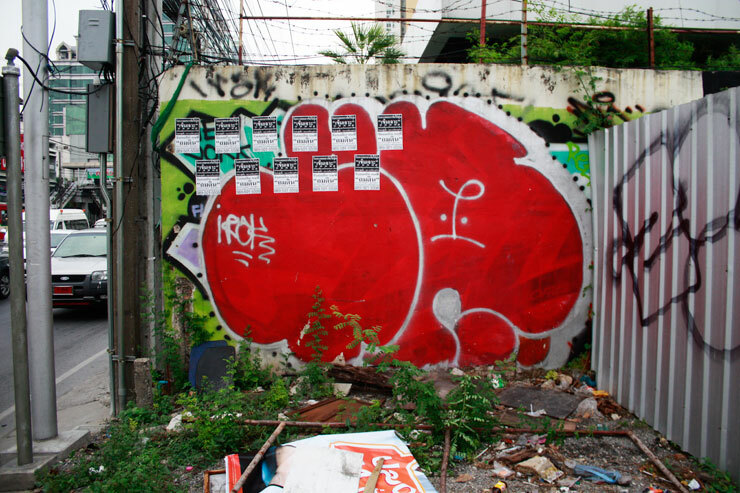 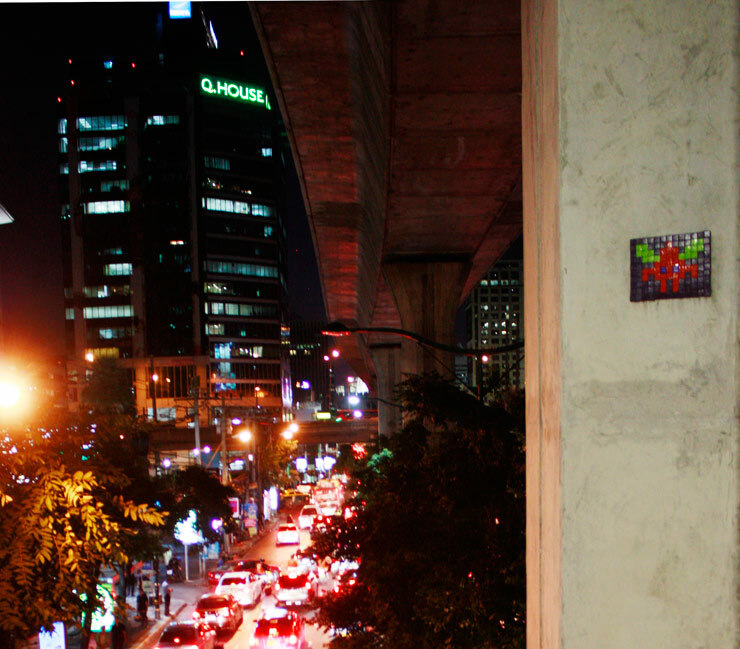 Thanks to Blanco for sharing with BSA readers these new shots he took of both the sanctioned murals and the unsanctioned works left behind by numerous crews on the streets of Bangkok. 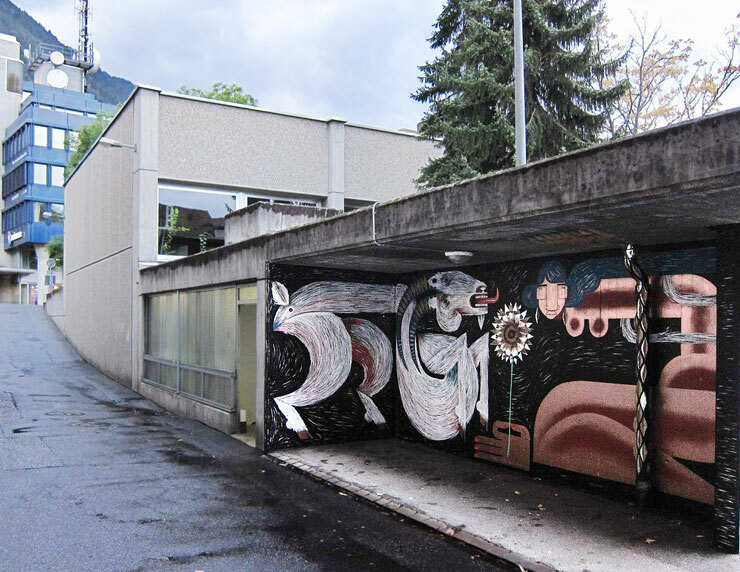 German Street Artist TIKA has been in Chur, Switzerland recently and last week she put up this piece called “Staibock & Hirtin”, which loosely translates to Albine Ibex and his shepherdess. 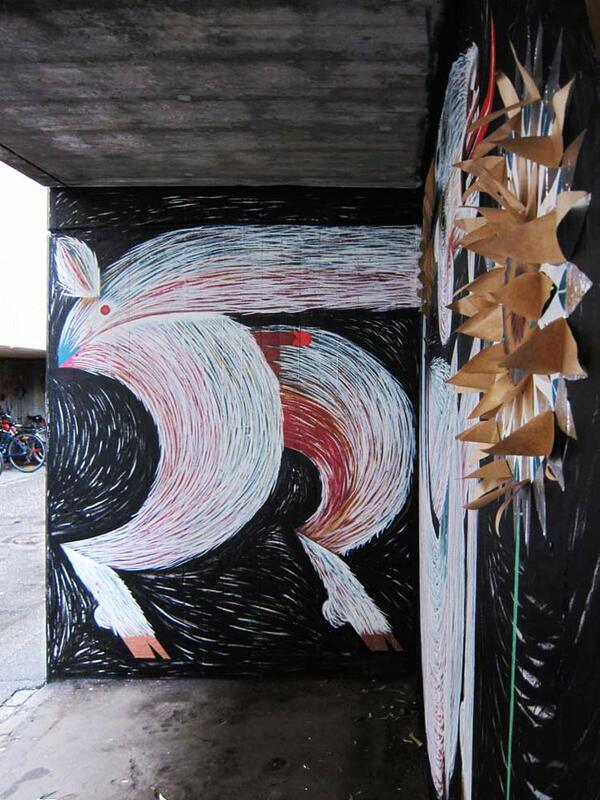 It is a local theme, this heraldic animal, she says, that has a lot of history in this part of the country. 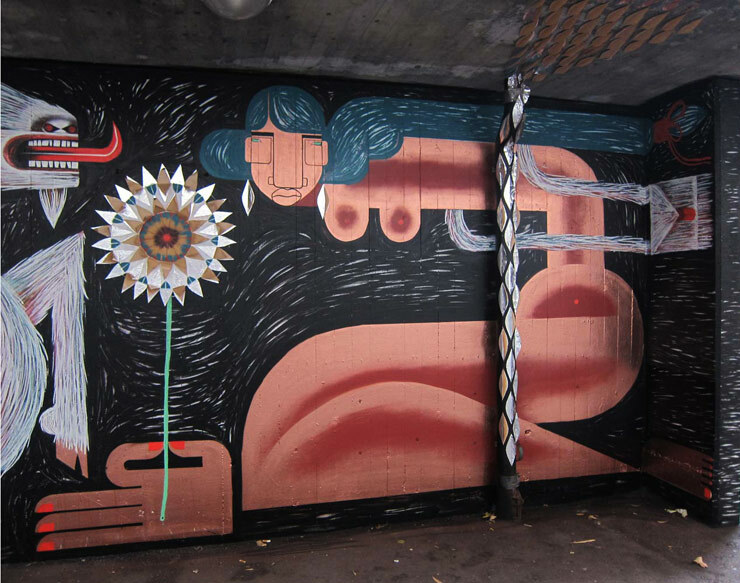 She did the entire wall with aerosol, using stencils and some tape for details. 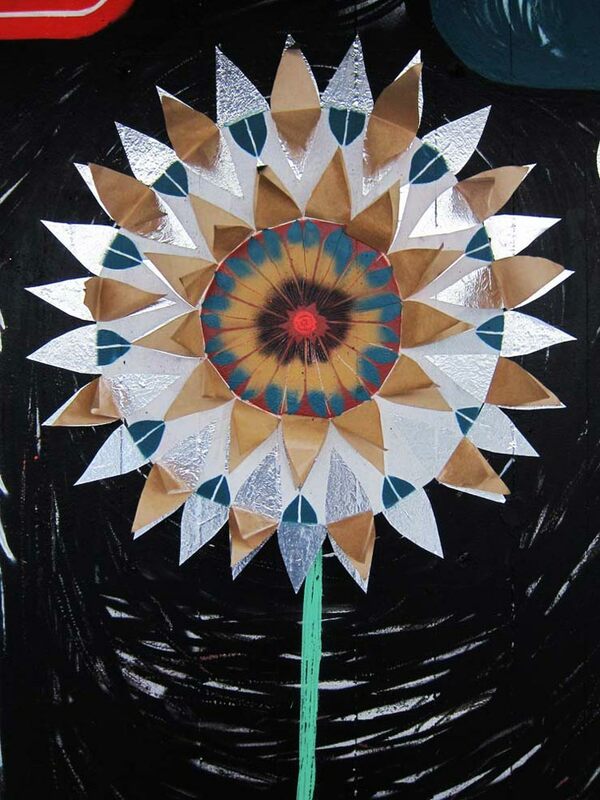 She pulled back some of the aluminum tape to give it a relief structure, which is a technique she’s been experimenting with for a few years. 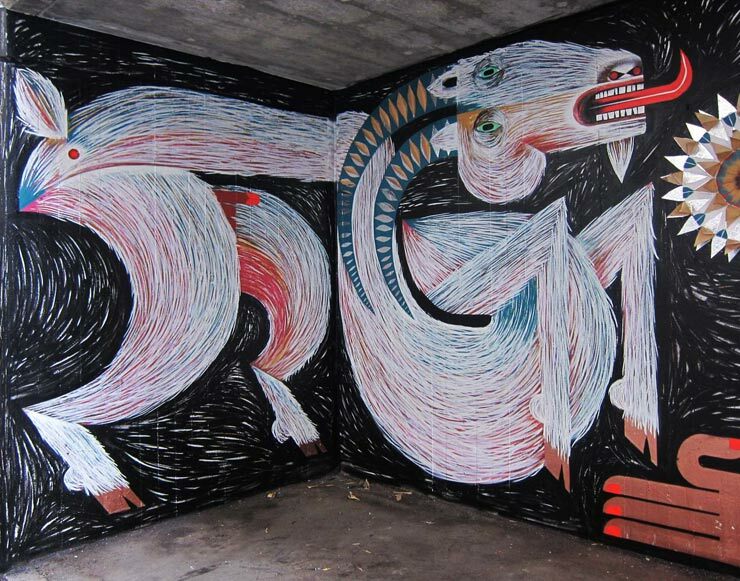 So there you have it, when in Chur doing a bit of gatukonst (street art), do as the Churians do and make sure all your ibexes have zipfels. 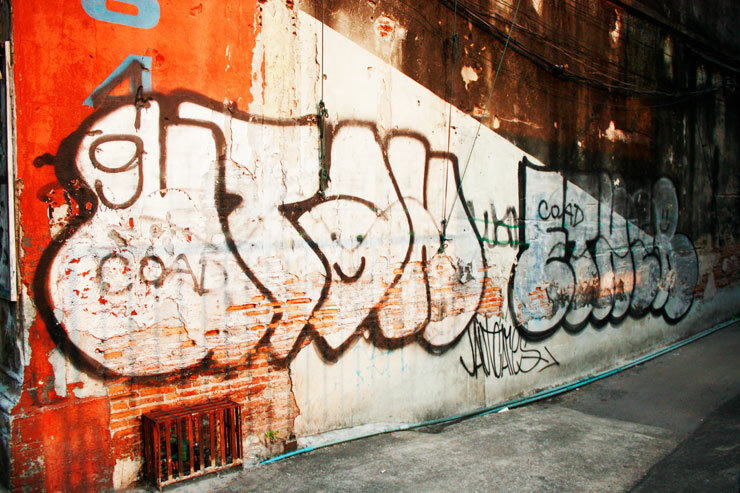 Great thanks to TIKA for sharing these new exclusive pics with BSA readers!